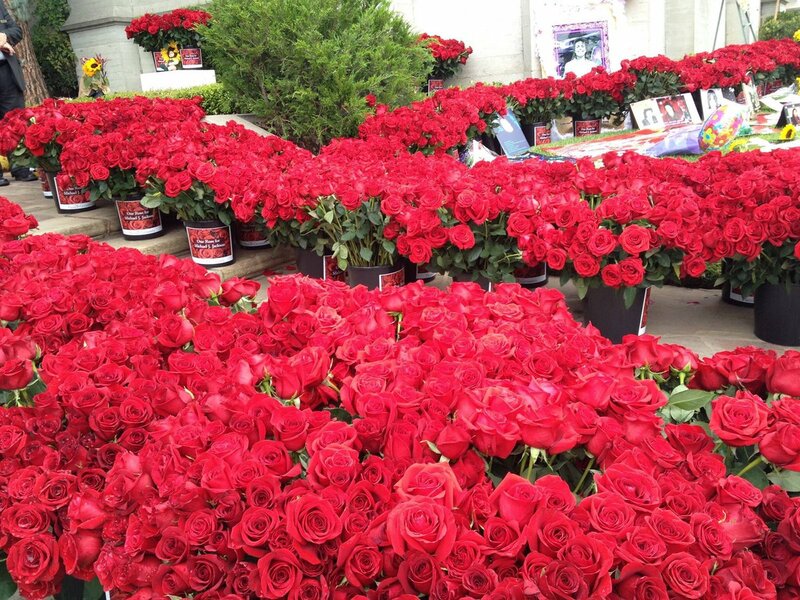 On June 26th in keeping with Michael's message we pay it forward, a large amount of the roses are donated to various charities as well as being placed for the children at Babyland and Lulabyeland in Forest Lawn in his name. PLEASE NOTE: Every year the calculated cost per rose includes fees, money conversions, trucking costs, taxes and other costs. Once the mentioned fees are deducted any left over balance will go towards the purchase of additional roses. Every rose represents a fans heart from all over the world, but together we are a blanket of LOVE celebrating his creative genius & legacy and come together worldwide to show our love & gratitude and to pay that love forward in his name. showing his legacy remains untarnished. Be a part of this beautiful tradition which grows every year.. Done! It's a briliant idea. Very nice touch to add the white roses for innocence this year. Thank you, Robyn. Done.. . It's a beautiful tradition, thank you to all who are involved! Here's a break down of how to purchase your rose(s)! We should maybe try to "recreate" June 25 2009 with big fanmeetings and many candales all over the world on June 25 2019 in honar of Michael and his true legecy. Maybe we can also try to bring some of MJs Music back in the charts at this time like it was 10 years ago. Last edited by ManBehindTheMirrOr - Dona; 18-03-2019 at 06:01 AM. I've already bought ten roses for 2019 - five red and five white - one rose for every year without him.